The neighborhood of Skanderborggade/Krausesvej is characterized by a mix of buildings made up of dense urban blocks from the turn of the 19th century, interrupted by a scattering of villas, and by a large gap in the structure caused in part by urban renewal. The Skanderborggade/Krausevej block consists of dense 5½ storey buildings encompassing a courtyard, which in this case is particularly narrow. As a consequence of this the courtyard receives little or almost no sunlight. The western end of the block structure opens up towards a new institutional pavilion. The client wanted a three unit daycare institution/nursery school, holding the potential for conversion into kindergarten units, composed of three rooms for three respective daycare/nursery groups, each with an accompanying changing room, a common room, cloakroom, kitchen, administration and secondary rooms. There was a call for outdoor areas comparable to that of the building area. The district zoning plan mandated institutional buildings of no more than one storey. In order to fulfill the requirement for an outdoor area equal to that of the built area, it was thus a prerequisite that the outdoor areas had to in large part be placed on the roof. To avoid any potential spread of fire, the building had to maintain a 5m zone of distance from any façade manipulations of the neighboring wall. To maintain a fire partition, all of the facades on the property line facing the courtyard must be windowless. The site contamination was in part decontaminated and in part encapsulated. The office worked out a series of light/shadow diagrams of the site and the adjacent properties. The open area in back of these buildings received partial sunlight between 12:00 noon and 4:00 pm at equinox and between 12:00 noon and 5:00 pm at midsummer. Thus the provision of access to the roof areas of the day-care institution by the properties in back was deemed desirable, providing the neighbouring residents with a potential twofold increase in hours of direct sunlight. The building design is the result of the planning regulations and authorities and the call for the greatest possible connection between the outdoor areas of the ground and roof plans, and taking optimal advantage of site’s sun orientation. The building consists of two planes which extend to the boundaries of the site. One plane forms the ground terrain plane covering the contaminated ground, a second forms the roof. The ground terrain surface is folded upwards in such a way that it forms a hill or slope between the ground and roof. The path of the summer sun from northeast to northwest traces the cut of the slope. The slope angle offers the best sun exposure to both the slope and the courtyard from the south and west. Underneath the slope forms an unheated space where a forest of columns is used for swings and other forms of play, when the weather is cold or wet. Two other light wells cut into the roof plane ensure daylight and a variety of outdoor space in conjunction with the other rooms of the building. By the combining the cloakroom, wind trap and entrance areas, and by minimizing the area dedicated to hallways by making the access way to all of the main functions through the common room, it was possible to make the common space 80% larger than stipulated. The common room forms the heart of the institution and is directly connected with the kitchen, the play areas, cloakroom and staff areas. Both users and staff enter the day-care institution from Krausegade. The entrance is through a common cloakroom serving all of the rooms. From the cloakroom there is access to the common room and the swing forest. There is an open connection between the kitchen and the common room, allowing the children to follow along in the activities or participate themselves, when there is an initiative to do so. The common space is set in direct connection with the circular outdoor space and the slope that offers access to the roof garden. There is access from the common room to the staff facilities, the napping area and all three group rooms. The three group rooms are designed to be different in shape and orientation. One group room has direct access to the circular courtyard and the façade facing Skanderborggade. 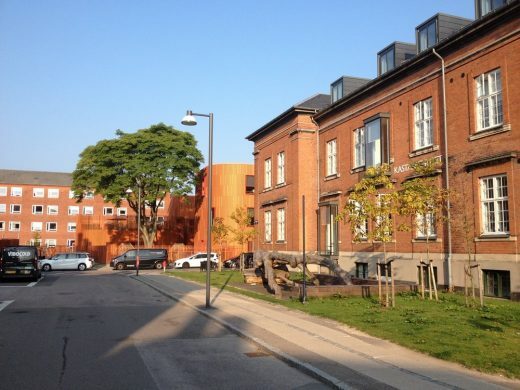 The second has access to the western courtyard and the façade facing Skanderborggade. The third group room has access to the western courtyard and the napping courtyard. The day-care institution’s napping area is placed in the north-eastern corner, protected from street noise and uninvited guests. Access to the napping area is through the napping area courtyard. The napping area courtyard is planted with tall standard deciduous trees, diffusing the summer’s sun through their leaves. The area underneath the slope is a subsidiary space used as an unheated play zone. The space is screened to the south and west by polycarbonate, taking advantage of passive solar heating during the winter months. Swings are suspended between the columns, and the institution’s baby carriages and playground toys are stored behind a simple sliding wall of plywood. The slope makes for a natural connection between the ground and roof. The courtyard is placed in conjunction with the common room and is thus the gathering space for the outdoor areas. The slope is furnished with large outdoor sack chairs designed specifically for this purpose. The sack chairs ensure safe play on the ramp. Parasols can be fixed in the middle of the sack chairs, providing shade as so desired. The ramp serves as a seating area when there are events. The western courtyard is an outdoor area limited to two group rooms. 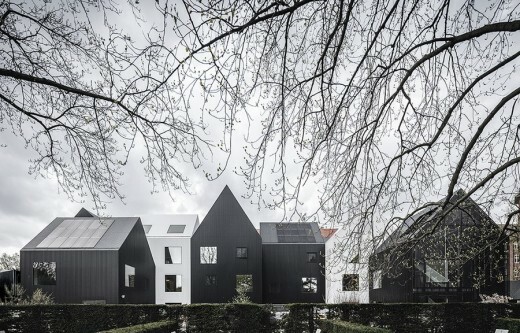 The scale of the courtyard forms the perfect framework for quieter more concentrated play. The roof garden connects directly with the slope and is designed as a free configuration on the actual roof plane. The roof garden is fenced by a white semi-transparent polyester fabric that allows for the maximum amount of openness and light intake. The garden is arranged as surfaces and mounds for a variety of activities, for example a barbeque area, sandboxes, water zone etc. The remaining activity areas of the roof surface can for example be used as roadway for moon cars and tri-cycling. Elements of concrete constitute the loading–bearing structure. The slope is light-weight structure of plywood resting on columns of concrete. The facades consist of stained pinewood frames and partially silk-screened glass. The floors are covered with linoleum. The swing forest is paved with concrete pavers. The roof garden slope and courtyard are surfaced with red granulated rubber. The hills and mounds are surfaced with green, blue and yellow granulated rubber. The western courtyard has a grass surface; the napping courtyard is paved with concrete pavers. The curtains are made of white nylon parachute cloth. The ceilings are made up of acoustic panels with built-in ceiling light fixtures. The outdoor sack chairs are upholstered in tarpaulin cloth and are fixed in place with galvanized steel mounts, with a built-in parasol base. A hydronic radiant floor heating system provides a comfortable atmosphere for children playing on the floor. The statutory mechanical ventilation systems service the group rooms, changing rooms, together with the kitchen, bath and toilets.